The National Institute of Polar Research (NIPR) publishes Polar Science, which is a peer-reviewed quarterly journal dealing with polar science in collaboration with the Elsevier B.V. The most recent issue (Vol. 18 published in December, 2018) was a special issue entitled “Recent advances in climate science of polar region (To commemorate the contributions of late Dr. S.Z. Qasim, a pioneering doyen of the Indian polar programme),” which featured polar science in India. India participated in the Antarctic observation in early 80s for the first time, and this participation was led by a marine biologist, late Dr. Syed Zahoor Qasim (1926-2015). Dr. Qasim, who served as a Director of the National Institute of Oceanography, was appointed as the Secretary of then newly established Department of Environment in 1981. In December of that year, he led the India’s first expedition to Antarctica successfully. Currently, India is operating two research stations in Antarctica, namely the Maitri Station and Bharati station, and continues to make important contributions to the international Antarctic observation community. In addition, India is conducting observation at the research station in Ny-Ålesund, Svalbard archipelago in the Arctic region. This progress of India in polar science is indebted to the great achievements of Dr. Qasim. The NIPR planned to publish a special issue focusing on recent progress in polar meteorological science in commemoration of Dr. Qasim. In this special issue, 23 articles primarily by the Indian researchers were published, covering polar meteorology to broader subjects related to the polar region, such as environmental change, weather/hydrological observation, paleoclimatology, geological and glaciological research into sediment on grounds, lake bottoms, and coastal ocean floors. The main articles published in this issue are summarized as follows. Sedimentation age of continental bedrock was investigated based on rocks obtained at the Schirmacher oasis (coastal bare rock zone) around the Maitri station and the results were compared to those obtained in the African Mozambique belt, the Antarctic Sør Rondane Mountains, and Madagascar. Based on the obtained results, the origin of the Schirmacher oasis was discussed (Vadlamani et al.). The transition of glacial recession was elucidated through an investigation of sediment in the Schirmacher oasis and its topography (Dharwadkar et al.). From the results of lake water quality in bare rock zones such as Larsemann Hills, the origin of the water was clarified (Wanganeo et al.). Based on the long-term meteorological observation data, it was elucidated that the degree of temperature change was slightly less over these 25 years (Ramesh and Soni). Changes in rainfall in the Himalayan region, which is referred to as the “third pole,” demonstrated the influence of global warming (Kumar, A. et al.). Polar Science is a peer-reviewed comprehensive academic journal relating to the polar regions of the Earth and other planets, which the NIPR began to publish in collaboration with Elsevier B.V. in 2007. 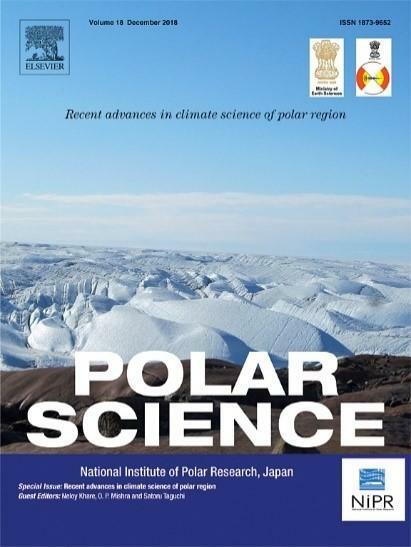 The primary purpose of this journal is to inform people about polar science, primarily in Japan and other Asian countries. Currently, more than 150 articles are submitted per year. As a result, this journal is recognized globally as one of the few comprehensive academic journals in the field of polar science. In addition to normal issues, Polar Science publishes a special issue annually on a given topic from various fields. The main characteristics of Polar Science are summarized as follows. Polar Science is an international academic journal with an impact factor of 1.031 as of 2017. Polar Science has an Open Archive whereby published articles are made freely available from ScienceDirect after an embargo period of 24 months from the date of publication. Printed products are also published. After Polar Science became an open archive in 2016, the number of article downloads have increased rapidly since then. Currently, approximately 6000 papers are downloaded annually. The Research Organization of Information and Systems (ROIS) is a parent organization of four national institutes (National Institute of Polar Research, National Institute of Informatics, the Institute of Statistical Mathematics and National Institute of Genetics) and the Joint Support-Center for Data Science Research. It is mission of ROIS to promote integrated, cutting-edge research that goes beyond the barriers of these institutions, in addition to facilitating their research activities, as members of inter-university research institutes.